James Hird praises gutsy Essendon win as injuries mount up. Final siren sounds and it's a season definining and gutsy win to the Bombers who held on and then kicked a couple of late goals to defeat a game Port Adelaide by 25 points. GOAL BOMBERSIf the gate wasn't shut by Hurley, Jetta has now bolted it shut. He marks and keeps running. Hartlett can't get him and Jetta kicks the goal. Essendon by 25. GOAL BOMBERSHurley marks and just about kicks the match winning goal for Essendon. They now lead by 19 points. BEHIND POWERSchulz is paid the free kick for over the shoulder but he misses to the left. GOAL BOMBERSHurley squares to Crameri who marks. From 15 metres out Crameri steadies the ship for the Bombers. Steadies the ship for Bombers? Oh well you know what I mean. It's like a rugby match out there at the moment with players everywhere. BEHIND BOMBERSPort turn it over in the middle. Melksham takes bounces and kicks, but it bounces the wrong way. BEHIND BOMBERSHurley has a chance 35 metres out, Carlisle bumps him as he kicks it and puts him off. GOAL POWEREssendon struggling in defence. They are being run off their feet here. The ball comes out to Thomas who kicks it around his body for a goal! GOAL BOMBERSCrameri leads and marks out the back. He lines it up, it looks good. The crowd like it and the goal umpire likes it. If Essendon win this match it will be some effort given they have three players injured in Hille, LovettMurray and now Myers. GOAL BOMBERSLonergan kicks around the corner and Carlisle marks it juggling one handed. He kicks the goal to extend Essendon's lead out to 8 points. At three quarter time Essendon holds on to a 2 point lead. It's a two point ball game in the shadows of three quarter time. GOAL POWEREbert receives a favourable decision, well based on the reaction of Essendon fans. He walks in and kicks the goal. BEHIND BOMBERSLovett-Murray tries to snap over his shoulder, but he misses to the left. BEHIND BOMBERSA rushed behind for the Bombers with the Port defence under enormous pressure. BEHIND BOMBERSLovett-Murray takes an opportunistic shot at goal but it hits the bottom of the post. GOAL POWERPort move the ball quickly catching out the Essendon defence with Schulz marking. Schulz goes back and pops it through. He is a good kick with Essendon only leading by 5 points. GOAL POWERWesthoff gets a risky set play in the square and it comes off with the Hoff kicking his third goal. GOAL BOMBERSJetta takes a good overhead mark and kicks the goal from 20 metres out. Essendon steady with that one. GOAL POWERAll of a sudden the Power are back in this match with Schulz's third. They only trail by 12 points. GOAL POWERWesthoff creates space and marks. His shot could not have been kicked any better. Beauty! The Hoff has two. BEHIND BOMBERSWatson passes to Hurley on the lead but he is tight against the boundary. Good effort by Hurley but it hits the post. BEHIND BOMBERSEssendon keep hunting the Power defence like a shark hunts its prey. Port's defence were forced to run it over for a behind. BEHIND BOMBERSMonfries again marks it within kicking range. This time he pulls it to the left. BEHIND BOMBERSMonfries marks inside 50 but hooks the kick looking for the extra distance. We are off and underway for the third quarter. The siren sounds for halftime with Essendon leading by 21 points. GOAL BOMBERSAnother goal to Essendon this time created out of nothing. Good defensive pressure in attack sees Lonergan get the ball out to Jetta who does his job. GOAL BOMBERSIt's all in numerical order for the Bombers with number 5 kicking to number 6 and Monfries finishing off the work. Good team goal by the Bombers. BEHIND BOMBERSHurley flies to mark strongly but his shot at goal is not as good as his mark. GOAL BOMBERSThe ball is kicked into Essendon's forward line. Zaharakis snatches it and kicks it though post high. GOAL POWERSchulz is infringed upon in the marking contest and will line it up from 50. He goes back, begins his fast bowler like run up, and splits the middle. What a great kick! GOAL BOMBERSEssendon are winning plenty of the ball. Another clearance goes inside forward 50 where Dempsey uses his pace, and kicks a beauty! GOAL BOMBERSStanton is paid the free kick and then paid a 50 metre penalty after the Power players do not play the whistle. Stanton kicks the easy goal from the square. BEHIND BOMBERSCrameri with a good chance inside 50, but he is bumped as he kicks and misses. BEHIND BOMBERSEssendon take it from defence to attack after Dempsey wins a 50 metre penalty. Lovett-Murray runs in and misses to the right. BEHIND BOMBERSHowlett drops the mark but is paid the free kick for a punch to the arm. From 30 metres out on a slight angle he misses to the right. Port have really improved on their skills and tackling over the summer. GOAL POWERPaul Stewart grabs it forward of centre. He keeps running, has options ahead but elects to kick and what a prophetic decision that was. He never looked like missing! The home crowd trying to lift their charges with Port defending well. BEHIND POWEREbert handballs to McCarthy under pressure who throws the ball onto boot and kicks a hurried behind. The siren sounds for quarter time with the margin between the two sides just the same as when they started. Yes, the scores are level. GOAL BOMBERSMonfries handballs to Jetta who snaps across his body. The end result never in doubt. GOAL BOMBERSGood mark taken by Howlett with an even better executed kick for a goal. Essendon trail by 6. GOAL POWERWesthoff always looks unorthodox in his approach but he does it well, riding the bump to kick the goal from 15 metres out. ESSENDON SUBSTITUTIONHille off injured with Lonergan coming on. GOAL POWERRedden has space and is spotted by his teammates. He runs in and kicks a very good goal. GOAL BOMBERSAlmost immediately Stanton takes advantage of a Port turnover and drills the kick through for a goal. BEHIND BOMBERSStanton sends his free kick long, looking for tall timber marking prospects, but it's through for a behind. GOAL BOMBERSAfter conceding the last three goals Crameri marks 20 metres out and stops Port's run. It's a good hotly contested game of footy at the moment. You would not know Port are rank outsiders. GOAL POWERWingard is infringed upon by McVeigh after being paid the free kick. The 50 metre penalty takes him 35 metres out directly in front and he finishes it off. BEHIND POWERHartlett's snap misses to the left of goal. 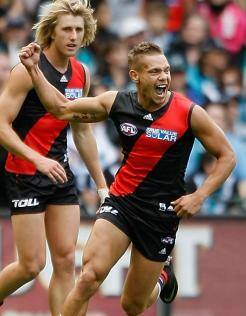 BEHIND ESSENDONThe Bombers launch it from the kick in, but Jetta is unable to kick straight. GOAL POWERPort push it forward where McCarthy takes possession and kicks a good goal. John McCarthy will prove to be a good acquisition for the Power if his first two matches in new colours are any indication. GOAL POWERSchulz shakes off Fletcher to mark. From 40 metres out he runs in and dobs it. Port Adelaide mean business this afternoon. GOAL BOMBERSEssendon kick the ball into 50 but it clears the contest. Hille runs onto it and snaps truly with the agility of a man half his size! Power holding their own early in the contest. Welcome to Etihad for Essendon hosting Port Adelaide. IT WON'T be remembered as one of the most attractive games of the season but for Essendon it didn't matter. In a contest riddled with skill errors and turnovers, the Bombers finished 25-point winners over Port Adelaide at Etihad Stadium on Saturday. The Bombers didn't make it look easy though. They recorded significantly more inside 50 entries, had more disposals, won the contested possessions and led in tackles. Yet the Bombers, due mainly to some scratchy possessions going forward, could only win 16.15 (111) to Port's 13.8 (86). The Bombers lost David Hille (calf), Nathan Lovett-Murray (hamstring) and David Myers (hamstring) to injuries, with all three set to miss at least three weeks. 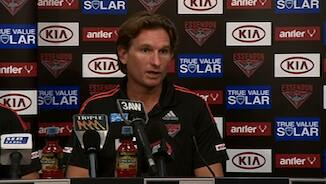 Essendon coach James Hird said he was "happy" to have won but noted that the club's skills needed some work. "Certainly our kicking, in terms of goalkicking, has got to improve," Hird said. "If we had have kicked straighter then the game might have been dead earlier but really, with the injuries we had, I still consider it a really good effort by our players." Despite Essendon's ascendancy in the key areas, Port never looked out of the contest. The Power's recent history against the Bombers suggests it is usually the way: before Saturday's game the Power had won 12 of their last 14 meetings with the Bombers. Even without promising tall forward John Butcher, Port's key men up front were always threatening. Jay Schulz (four goals) and Justin Westhoff (three) helped peg back Essendon's four-goal lead early in the third term, but the Bombers' consistent midfield, including Brent Stanton (25 disposals) and Jobe Watson (25), pushed the game Essendon's way in the last term. Port coach Matthew Primus said his side was lucky to have been in the game at such a late stage given the Bombers' early command. "I thought they were terrific in the first half apart form their finishing," Primus said of the home team. "I thought it could have been all over then. "I spoke to the players at half-time and said that because of their lack of finish they've given us the opportunity to still be involved in he game. To our players' credit they were able to believe in that and get involved." Primus' assessment was about right. Scores were even at the first change but it was clear the Bombers, although wasteful, were the better team. In similar fashion to their round one win over North Melbourne last week, they were dominating possession without making the most of it. They pumped the ball inside 50 20 times to Port Adelaide's nine in the first quarter, but often shots at goal were rushed, and entries hopeful rather than precise. Calmer heads and cleaner disposals were required. The loss of Hille midway through the first term to a calf injury meant the Bombers needed to restructure their attack. Patrick Ryder (46 hit-outs) moved into the ruck and Jake Carlisle shifted forward, with the pair beating Port duo Jarrad Redden and Daniel Stewart. The scrap continued in the second term until Brent Stanton earned a free kick, and a subsequent 50-metre penalty, to hand the Bombers a certain goal and regain a two-point lead. Courtenay Dempsey followed it up immediately with a brilliant running goal from outside 50, and the Bombers entered half-time having kicked five of the last six goals and holding a 21-point advantage. The second half continued in the same vein, with neither team able to take complete control of the game for a sustained period. David Myers strained a hamstring in the last quarter leaving the Bombers with only two players on the bench. They looked out on their feet but held on for the win, with Stewart Crameri kicking a goal and then, minutes later, passing to Michael Hurley, who sealed the win. The Bombers left with the four points, but also with the knowledge they need to sharpen up several areas to remain unbeaten for much longer.